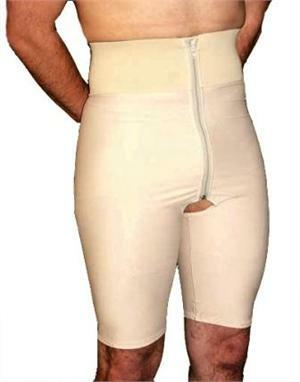 The Male Girdle is specifically designed to provide optimal compression in the lower abdomen area. The front zipper is protected with an inner safety flap and completely out of the way of any critical areas to a male. Optimal compression! The zippered male brief is specifically designed to compress the lower abdomen area for the best possible healing result following male surgical procedures such as liposuction or hernia operations. The garment features an inner safety flap to protect sensitive skin from the front zipper at all times. Also works great as a shaper to add definition to your torso, reduce the appearance of the waistline, and smooth abdominals. Product Description: The zippered male brief provides optimal compression in the lower abdomen area. Designed with the wearer’s complete comfort in mind, the garment features an inner safety flap to protect sensitive skin from the front zipper and a specially-designed 4-inch non-rolling waistband. Common post-surgical uses: The zippered male brief from Nouvelle is an amazing product providing the best targeted compression for fast healing following male cosmetic procedures such as tummy tuck (abdominoplasty), abdominal liposuction, stomach liposuction, hip liposuction, thigh liposuction, flank liposuction, buttock liposuction, lipoplasty, suction lipectomy, liposculpture, smartlipo, vaser liposuction, and laser liposuction for men. Non-surgical advantages: Use to help flatten and shape the abdominal area, improving body contour and appearance beneath formal suits, athletic wear, business attire, and casual clothing. This can be a powerful tool in sculpting and shaping the appearance of loose tissue in the abdomen, flank and groin areas following weight loss. Carefully crafted just for men: Nouvelle’s exclusive designs for men cannot be found in retail stores. We proudly offer only latex-free products MADE IN THE USA. Our garments use a 55% Lycra®/45% nylon content for a smooth, comfortable feeling next to healing skin. This fabric combination ensures garments never lose compression integrity with continual use and appropriate washing procedures. This particular male girdle features an exclusively designed inner safety flap to protect sensitive skin from the front zipper at all times. It’s the most comfortable and effective post-surgical brief on the market! 1. Fabric structure. Featuring four-way stretch and memory, each garment can withstand numerous washes, endure extremely long wear times, and miraculously retain original shape and quality. All designs have been through rigorous testing and meticulous scrutiny to ensure complete comfort and enhanced efficacy of every angle, seam and compression area. 2. Quality craftsmanship. Nouvelle designs have a reputation for superior craftsmanship. We offer distinctly soft, silky textures so comfortable against sensitive surgical areas, you will be tempted to continue wearing them long after healing. We use only the finest fabric available, and hand-inspect each seam and stitch to ensure garments are soundly, solidly constructed. 3. Comfort. Realizing post-operative healing stages can be uncomfortable, we paid particular attention to every conceivable way the fabric of the zippered brief touches the skin. Stitches are constructed so they are perfectly flat, so as not to aggravate incisions. Benefits: When applied correctly, compression wear can increase blood circulation around surgical areas to accelerate healing, diminish swelling, and flush out harmful fluids. In the event of sudden movements such as sneezing or coughing, the garments help protect and stabilize the surgical site, minimizing discomfort. The result is not only a shorter recovery time, but a cleaner surgical area with minimal scarring. Instructions: Simply pull on garment and zip up front. Care: Hand or machine wash using cold water and mild soap. Line or gentle machine dry only. Consider buying two: A good rule of thumb is to purchase multiple briefs so you always have a backup. As consistent compression is the key to a successful surgical result, you will want to ensure the site is always protected and secure.